Forum Index > Off-topic Talk > Key behind Lithuanian military success? Posted: Thu 13 Oct, 2011 5:26 am Post subject: Key behind Lithuanian military success? For nearly a decade now I've been intrigued by the Baltic Crusades and the Lithuanian's success in carving out an eastern European empire despite numerous attempts by predominately the Teutonic Knights and other Latin crusaders to subjugate them. Still I haven't found much information on how their armies looked like - how they were organized, what arms and tactics they used etc. I'm sure there are at least a number of members on this board who has an insight into this somewhat esoteric matter? How exactly were Lithuanian armies able to regularly defeat the Teutonic knights and other powerful opponents, including the Poles and the Tatars of the "Golden Horde"? Judging by their toll of victories, it is obvious that the Lithuanians from the mid 13th century and onwards were far superior to anything that the Crusaders could throw at them (with the exception of siege warfare). I've wondered this as well. From what I read from the book "The Teutonic Knights: A Military History" (who's author escapes me at the moment). The Balts, if nothing else, were really, really good at choosing fighting ground that negated the effect of cavalry. It also seems that while they did fight prolonged battles, most of their army was very very mobile, and preferred to hit and run multiple times in one sitting before finally closing into a prolonged melee. I also got the impression they liked bows. That's based off this one book. It may not even be right for all I know. It helped that even though the Teutonic knights were a military order, they seemed to make really dumb mistakes sometimes. -Lets sail a 200 man boat under a hostile fort! -Let's march on the frozen lake! -Let's wake the enemy forces with an emissary before we attack! I'm not saying the crusaders weren't good at fighting, I'm saying that they were really impetuous sometimes, and this was used against them many times by the Baltic armies. They still lost in the end, so that says something for the Teutonic knights. Hope this is accurate, and if so I hope it helps. The book I got this from was a loan, so I don't have it anymore to make specific references. You might find it interesting though. "The Teutonic Knights: A Military History"
The Baltic People, at least in the initial stages of the "Crusades" were pretty well just infantry, not a lot of bows in use (Perhaps because of their thickly wooded lands? ), and the infantry were not greatly armoured, illustrations and information seems to indicate little mail even, most in what could be clothing or padded garments. The Teutonic attacks usually seemd to be to try to ride down the infantry, hope the cavalry would get them to route, and if not withdraw and get into an infantry slogging match. The teutonincs were better armoured and armed of course, but they usually seemed outnumbered, and fighting in hostile territory. Apparently the Baltics used large earth and timber "hill forts" for protection, and apparently taking one was not an easy task. Towards the end of the period you see crossbow use among the Baltics (the Teutonics had tried to take great care that any of their crossbows did not fall inot the teutonic hands, but it was probably an eventuality that some did anyway). You also see better amour among at least the Baltic horse towards the end of the Crusades, and at the end of the Crusading period their cavalry was in demand among other nations as mercenaries, so they evolved militarily over the period of the Teutonic crusade. Vincent: The book you are referring to is written by William Urban and it is standing in my book shelf, but thanks anyway! I'm also under the impression that the Teutonic Knights often acted rashly (maybe they were seeking martyrdom rather than victory? ), but then the Lithuanians were also able to tackle and defeat various opponents including the Tatars. Sure, but still the natives can't have had an overwhelming advantage in numbers as the Baltic States were quite sparsely populated and the number of men available for military service must have been limited. From what I've seen many Baltic artefacts, especially Estonian and Curonian ones, reflect a strong Scandinavian influence. Are there any evidence of shield walls and other "viking" tactics used by the Balts? At the same time the southern Balts including the Lithuanians and Prussians appear to have received influences from the steppes, as there are a number of scytic-turkic-styled antropomorphic stelae or balbals found in Prussia. Would that have been evident in their manner of warfare as well? It is true that the Crusaders had an initial military success which enabled them to establish a bridgehead in the Baltic, but it wasn't long before the Balts seem to have adapted to the initial shock and were able to fight back quite successfully. If it had not been for their fortifications and the repeated intervention of guest Crusaders from the West, the Teutonic Order would surely have been ousted from the Baltic region during the Prussian uprising in 1260 which if anything demonstrated the shortcomings of the crusaders and the superiority of native Baltic warfare. True, and interestingly enough you also see the crusaders picking up Lithuanian/"Eastern" shields, pointed helmets, spears and other gear from their main adversaries. From my reading of the above mentioned book, and 'the Northern Crusadies', Terain and weather seemed to be the biggest determining factor in the Teutonic Kinights failure to permanently occupy Lithuania. First of all, the campaign seasons were quite limited. Second, between swamps, woods, rivers, snow, and muck, the advantage of heavy cavalry was lost. And for similar reasons, logistic supply lines were unreliable - a factor ignored by us armchair generals but most important to real generals. The Lithuanians would presumably be less affected by these factors because it was their home turf and their fighting style was adapted to it. This might sound purely defensive and therefore not explain their periods of expansion, but having a good defensive position means they could recover from defeats better than opposing armies that were essentially foreign invaders. Hi. I write only about my knowledge about Curonian warriors, because last two years I work at my first half of 13. century Curonian warrior. And i think someone from Lithuania write better than lithuanian tribes, than I. And excuse me about my language it's not very well. 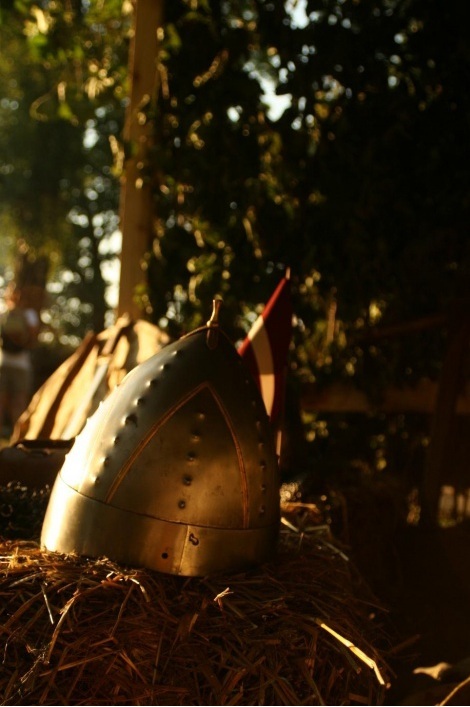 Basicly Curonian warriors was good equiped warriros at that time, we have knowladge about six Curonian helmets. Also I have information about 4 lithuanian helmets and 2 prussian. It's good number with helmets for Baltic tribes. Then is information about some chainmail samples and one lammelar armor in Curonian land. About Curonian weapons, if speak about axes, swords and spears there is Scandinavian influence, how strong hard to say. I have not lot of information about shield types but I think for 13. century they use round, kite and early pavise type. Well, are big equipment quality difference between crusaders and Curonian, hmm I think not so big. http://www.youtube.com/watch?v=_NCGr9pt-_Y movie trailer where can see lithuanian warriors, this is movie about Saules kauja or Battle of Saule http://en.wikipedia.org/wiki/Battle_of_Saule. I think these are valid points; logistic and terrain-related difficulties must have meant that Crusader armies were kept small by necessity, my impression is that they were able to muster large raiding parties rather than armies. Still though these small crusader armies were able to defeat most native Baltic armies that faced them at the early stages of the Northern Crusades, for instance the Prussians were defeated at River Sirgune/ Dzierzgoń in 1234 and even the Lithuanians were defeated twice in 1213 and 1214 where two of their leaders perished atthe hands of the Sword Brothers. By the 1230s and the time of the first Prussian uprising in 1242 however the tables seems to have been completely turned and the Balts were able to fight back with great success, especially the Prussians and Lithuanians. Thanks for showing us that helmet, really interesting. Does it represent a "pure" Curonian form or are there examples of similar helmets used by other Baltic and perhaps Slavic peoples? While the Baltic Lands may have been sparsely populated compared to some regions of Western Europe there were still a lot of native Balts compared to the Swordbrothes, the Teutonic order and their local secular vassals & allies. For example at the height of it's power the Swordbrothers only had 1000-1600 'German' fighting men from all sources compared to the estimated 5000 Baltic auxiliares of the Order. And those Germans would be spread out across livonia on fiefs and castles rather than concentrated into a single field force. The position of the Livonian branch of the Teutonic order was not much better. While the military potential of the secular Germans grew steadily in Livonia the bishops and the Rigans were often in conflict with the Teutonic order and it took massive outside threats to unify them. So whenever the support of the Baltic auxiliaries were lost the order would find it self in a bad position, the battle of Durbe is a classic example of this. In Prussia the situation was similar, even though Prussia was sparsely populated the population of an estimated 170.000 Old Prussians still provided a huge military potential compared to the Teutonic order. The numerical advantage became even larger when you considered the early habit of the Teutonics to spread out in small detachments & garrisons in order to hold as much territory as possible. This resulted in a very bad military position during the Great Prussian revolt as not only were the individual castles & forts weakly held but any field force created by drawing men out of them was rather weak and therefore easily outmatched. It didn't help that for much of the 13th Century the Teutonic Orders main force was deployed neither in Prussia, nor in Livonian but fighting in Ouremer. Much is made of battles such as Skuodas were 33 brethren were killed or Durbe with 150 brethern lost but these losses pale compare to the 297 brethren killed in a single day at La Forbie. In the end the success of the Prussians was temporary, like the Germans during the final offensive of 1918 it was won at a price they could not pay and when the Teutonic order and it's crusader allies went on the offensive the Prussians were decisively crushed. I can answer this for Peteris - it is purely Curonian form of helmet, aparently - only one of them is found in burial field where there are both semigallian and curonian burials (Pavervite-gudi helm). Peteris already listed all known finds of helmets of this type and they are all very similar in construction. Daniel, if the estimation of 170,000 Prussians is true it would have meant that Prussia was one of the most densely populated areas of High Medieval Europe, which I highly doubt considering the lack of advanced agriculture and prevalence of swamps and forests. It could be compared to the fertile, (then) Danish province of Skåne/Scania of roughly the same size which had about 100, 000 inhabitants in the 13th century. Or does the figure refer to all Baltic speaking peoples including the Lithuanians, Semigallians, Latgallians, Curonians etc? Although I agree that the Balts must have outnumbered the Knight Brethren and their subjects, I'm not that convinced that they could muster huge armies that could overwhelm the crusaders by numbers alone. The Prussians were not crushed in a single blow delivered by a crusader offensive, but rather slowly grinded down through endless of raids and subjugated tribe by tribe, stronghold by stronghold. It is interesting to note that while the teutonic knights and their western allies had clear advantage in siege warfare, every single field engagement (at least to my knowledge) after 1236 was won by the Balts. My assumption is that the Balts, or at least the Prussians and Lithuanians, quickly adapted to crusader tactics and developed a form of warfare of their own which worked perfectly well against the stagnated and predictable knightly tactics employed by the Knight Brethren and western crusaders throughout the 13th century. The question is how they did it? Sure, later generations of Balts and Poles have liked to portray their ancestors as some kind of "noble savages" who relied on brute force and "pagan virtues" to defeat their supposedly "decadent" enemies from the West, but of course this is only romanticized 19th century nonsense which tells us nothing about the real factors behind the military success of the Balts and the Lithuanians in particular. Keep in mind that the Old Prussians inhabited a area that was larger than the later border of East Prussia and that the 13th century had a climate that was diffrent from later periods, simply put it was more pleasant and fertile than the centuries that followed. 170.000 is Urban's and I'm willing to give him the benefit of the doubt until he's prove wrong by some one with equal or better knowledge on the subject using better sources & methods. If your enemy is field forces numbering in the hundreds or even tens it does not take a huge army to overwhelm them by use of numbers, particularly if you have adapted & improved your own tactics. The fact that the Prussians were able to besiege or blockade just about every Teutonic castle in the intial phase of the Great Revolt is telling evidence of the considerable number of warriors they could field. Very few groups the size of the Prussians were 'crushed' in a single offensive in the middle ages, this isn't a blitzkrieg period. Witness the fact that even with victories like Agincourt the English could not crush the French in a single campaign. The slow but steady grind of siege & raid was the usual way that wars were won if the enemy had anything resembling strategic depth. While the Prussians won the first engagement the second in which the Teutonic cavalry arriving from Elbing slaugther much of the prussian infantry while the prussian cavalry routed in panic can hardly be labled a Teutonic defeat. In other examples faulty reason are used by the same ilk to explain away defeats like the battle of Rudu 1370. In other cases victories for the Teutonic knights like Strawe (Streva) 1348 get labled as "costly" for the Teutonics without any evidence supporting the lable. Another factor to consider is that the crusaders defeats are far better recorded and to some extent got more attention for their own side than the crushing of an equal number of "pagans". The chroniclers tend to focus on the armed martyrdom of the defeated brethern while cutting down a similar number of pagans are only mentioned in passing if at all. The Prussians can hardly be said to have adapted to crusader tactics nor developed a perfectly working form of warfare, if they had done so they would not have been utterly defeated. They clearly were able to improve their military effectiveness in certain types of warfare but the failure to master offensive & defensive siege warfare as well as the inability of the tribes to cooperate in a unified manner meant that defeat was probably unavoidable as long as the Teutonic order was willing and able to mount the sustained effort to reconquer the area. Furthermore if the Prussians were equal or superior in field warfare as you claim why did they not pursue a strategy of battle to defeat thos pesky crusader forces raiding their lands and capturing their strongholds? A force involved in a siege can hardly avoid battle and there isn't much evidence of the crusaders making use of extensive fortified camps to protect themselves. The Lithuanians is the interesting case as they were clearly able to adapt and improve on a national level though they certainly had the help of some of the worst terrain in the area. Samogithia is not a nice place to wage war even before you count in the hardly local warriors. I'd make the educated guess that the seeds of lithuanian success can perhaps be found if one can study how their arms & armour evolved as well as their undoubted skill at mounted warfare. On top of that they did learn siege warfare well enough to become too tough a nut to crack. Particularly after they were able to hugely expand their available resources by conquests in the east and south. I have nothing but respect for Urban but still I'm hesitant to accept those figures. But since I really have no counter-arguments apart from my scepticism based on comparative demographics I will leave that discussion. Although I'm sure that the native Balts were able to muster several armies that vastly outnumbered the Livonian and Teutonic Knights in total, I doubt that they were able to field exceptionally large individual armies due to logistic and strategic challenges. After all, the Baltic armies were tribal militias made up by part-time warriors who were not eligible for military service throughout the year. I got the impression that you made such a claim (that the Prussians were crushed by a single crusader campaign), but I must have got it wrong then. Certainly such wikipedia-articles do not count as reliable sources, but having read most works by William Urban and other authors on the subject I would still adhere to my statement, although it is true that the Teutonic Knights were more successful during the 14th century once they had put down the last Prussian resistance and consolidated their Baltic conquests. But are there any references to field engagements 1236-1300 where the Knight Brethren defeated the Balts? The Prussians can hardly be said to have adapted to crusader tactics nor developed a perfectly working form of warfare, if they had done so they would not have been utterly defeated. Not a perfect , all-encompassing form of warfare, but effective battlefield-tactics that evidently worked at numerous occasions. They clearly were able to improve their military effectiveness in certain types of warfare but the failure to master offensive & defensive siege warfare as well as the inability of the tribes to cooperate in a unified manner meant that defeat was probably unavoidable as long as the Teutonic order was willing and able to mount the sustained effort to reconquer the area. They did, killing hundreds of Knight Brethren and several of their commanders between 1242-1295. The overall Prussian as well as Lithuanian strategy seems to have been aimed at intercepting and challenging the crusader armies or raiding parties as they returned home after a reyse into enemy territory. Although I'm sure that the native Balts were able to muster several armies that vastly outnumbered the Livonian and Teutonic Knights in total, I doubt that they were able to field exceptionally large individual armies due to logistic and strategic challenges.